Lightweight vertical grip clamps securely to Picatinny forend rail to give the operator a more comfortable shooting stance and better weapon control. Helps control muzzle climb during sustained fire for quicker, more accurate follow-up shots, and minimizes hand fatigue when holding weapon in the ready position for long periods of time. Shape is narrow at the top for secure purchase by the thumb and forefinger, with a palm-filling swell at the middle, and wide, deep, concentric ribs around the lower 1/3 of the grip for a comfortable, ultra-secure grasp. Removable core has a large, waterproof storage compartment that can hold a spare bolt assembly, two AA or CR123 batteries, or other small parts. Screw-on, O-ring sealed cap removes easily and has padded interior to prevent rattling of items inside. Easy-to-use clamping system attaches simply by unscrewing the entire core, sliding the grip onto the rail, and lining it up over a slot with the aid of the alignment windows. Then screw the core back in tight for a rock-solid attachment that won’t let loose. 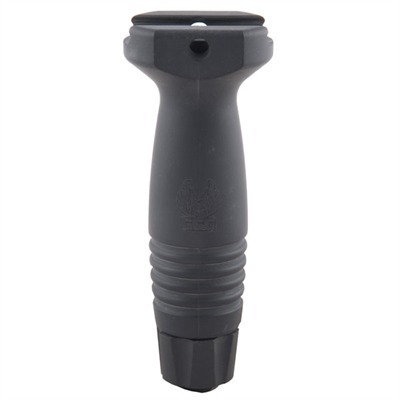 Reinforced, Acetal cold polymer construction handles the knocks and dings of tactical operations, as well as extremes of heat, cold, and humidity. SPECS: Acetal polymer, matte black. Grip extends 4¾” (12.1cm) below rail. Approx. 1-5⁄16" (3.3cm) at widest point. 2.4 oz. (69g) weight.